Thirty years ago this month, in October 1987, Sting (born 1951, christened as Gordon Matthew Sumner), released his second and very significant solo album …Nothing Like The Sun. Sting/Sumner was born and grew up in Wallsend, a small town near Newcastle upon Tyne, in North East England. His father was raised Catholic; his mother was raised Anglican. He attended Catholic schools, had his first communion and confession when he was seven, and received the sacrament of confirmation at the age of 13. He celebrated his first marriage at 24 years old to the Irish Catholic actress Frances Tomelty in a Catholic church. His first two children (both with Tomelty) were likewise baptized as Catholics. By the time he began his successful musical career he did not consider himself a Catholic or an adherent to any other specific religion anymore, and did not change his mind since. He is not, however, an atheist. Spiritual notions of various kinds are important to him, and religious motifs and ideas are evident in some of his songs. Both his Catholic childhood, as well as later influences, played important parts in the development of his spiritual worldview. Now will be appropriate time to explore such notions in his 1987 album. 1987 was an intensive year for Sting. His mother Audrey died after battling cancer for several years. A few months later, his father Ernest died as well, also of cancer. 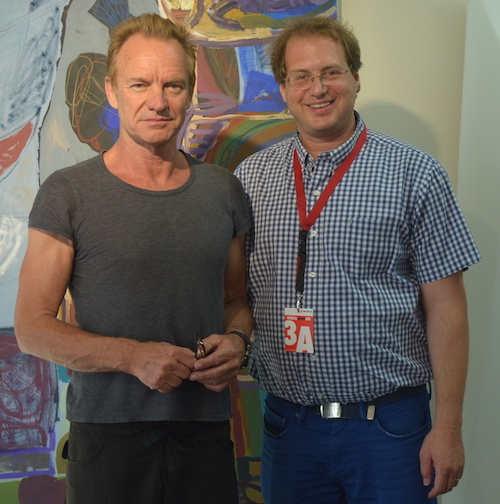 During his mother’s last months, Sting wrote the songs for the album in question and produced it. In a filmed interview from 1999, he admitted that these circumstances strongly influenced his output: “I ended up writing an album really, I think, about women. My relationship with not only my lovers, but my mother. My mother was dying. I think that experience informed that record, as a shadow, over that record.” Appropriately, Sting says in the album’s liner notes, “This album is dedicated to my mum and all those who loved her”. In the song that opens the album, “The Lazarus Heart,” there are no obvious religious themes, although it seems very plausible that the reference in the title is to the most famous Lazarus in Christian culture: Lazarus of Bethany. In the New Testament story about Lazarus (John 11), Jesus resurrects him after he was dead for four days. The story is one of the longest descriptions of events related to Jesus, and also includes the famed shortest verse in the (English) New Testament: “Jesus wept.” In Sting’s childhood region, the story existed not only as a text printed on paper, but also as an image carved in stone. According to scholars, a carving on the Rothbury Cross from Northumbria, made around 800 CE (and visible in the local The Great North Museum: Hancock, in Newcastle) shows the scene of the raising of Lazarus. When we consider that the idea of a life-giving wound is very much part of the Christian belief about Jesus’ crucifixion, and the centrality of the Catholic cult of the “Holy Heart of Jesus” during Sting’s childhood in the 1950s, it is hard to imagine that the title and the song which speaks about a wound from which “a lovely flower grew” do not, at least indirectly, relate to Christian motives. The same album includes the song “History will Teach Us Nothing.” The song might be in the tradition of what biblical scholars call “Wisdom Literature”: a list of ideas and instructions from a wise person, seemingly based on what that person has learned from experience and history. The song’s overarching topic is the importance of peaceful solutions to conflicts, the usefulness of reason, and the need to protect human rights. Considering that religions played a central role in human history, it is not surprising Sting has something to say about them. In fact, he has two things to say. First, he claims, “If God is dead, and an actor plays his part, his words of fear will find their way to a place in your heart.” The idea that God is “dead” became common in Western thinking due mostly, it seems, to Friedrich Nietzsche (1844-1900), who famously declared it in several places in his work. Here Sting is indirectly claiming that in order to be afraid of God, God does not even have to be real. An actor who “plays his part” can be just as successful. It is likely that this statement is directed towards many believers: it is quite possible, Sting tells them, that what you believe to be God’s words, are not. What you fear might be nothing more than the words of a human who pretends to deliver God’s message. Following this statement about God, Sting immediately has something to say about faith, or perhaps religion itself: “Without the voice of reason, every faith is its own curse.” Sting is not opposed to faith (or religion) in general. He cautions though that “the voice of reason” is what can keep faith (or a religion) from becoming a curse. Perhaps the clearest and most elaborate example of Sting’s incorporation of biblical themes and images into his work until that time is “Rock Steady,” the ninth song in …Nothing Like the Sun. It is obvious to those who possess even the most basic knowledge of the Hebrew Bible that “Rock Steady” is a modern rendition of the account of Noah’s ark and the flood (Genesis 6-8). In the biblical account, God is unhappy with the humans he created only a few chapters earlier, and tells a man named Noah to build a boat (an “ark”) that can hold his family and many animals. Noah obeys, and God sends a ferocious rain (the “flood”) that covers the earth, killing all that are not aboard the ark. When the flood abates, Noah and those who are with him repopulate the emptied earth. This version of the story has been greatly simplified. In reality, the narrative as it appears in the Bible is full of additional details, as well as contradictions. For centuries scholars have agreed that what we have in the Bible is a complicated mix of two different versions of the same story. Like any person wanting to tell this story in a more or less coherent way (myself included, in the previous paragraph), Sting had to make specific choices regarding which biblical elements to include, and which to ignore. So, for instance, in Sting’s version, Noah tells the narrator “I’ll save two of every animal,” following Genesis 6:19-20 and 7:7-9, and ignoring Genesis 7:2-3 which states that, for some species, seven of each were to be saved. Sting’s version also says that “it rained for forty days and forty long nights” (following Genesis 7:4, 12, 17), although the Biblical text—in the composite form that we have it—seems to say that the flood continued for much longer (even after the rain stopped), and that the boaters remained on their ark for almost a year. In Sting’s version, the male narrator and his female companion, both assisting the unnamed “Noah” figure, want to leave the moment the rain ends, even if the earth is still covered with water. In another song from the album, “The Secret Marriage,” Sting refers to some common religious elements that are part of Christian wedding rituals, saying that in the “Secret Marriage” he describes, these rituals never took place: “No earthly church has ever blessed our union… No bible oath to swear.” In some places, Sting is quoted saying that this song is a biographical one: “[It] is my way of trying to justify or rationalize why I wasn’t married to the woman I had lived with for 10 years.” Five years later, in 1992, Sting and Trudie Styler, his second (and current) wife, got married, and their union was actually blessed in a church. “Our marriage is a secret no longer,” he supposedly said, according to the same quote. * A link to additional notes and bibliographic essays accompanying the book Religion Around Sting will appear here upon the book's publication. * For links mentioned in the article "Death, Resurrection, Sacraments, and Myths: Religion Around Sting", please add "http://links.religionaroundsting.com/" to the link given in the article, while dropping the "#" sign. Thus, for example, the link for "#cr10" is "http://links.religionaroundsting.com/cr10". Evyatar Marienberg is an Associate Professor at the Department of Religious Studies at the University of North Carolina at Chapel Hill. (c) Evyatar Marienberg. Simple theme. Powered by Blogger.